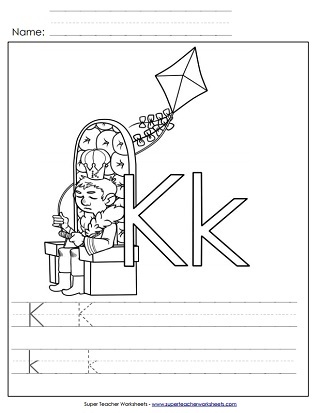 Trace the upper-case and lower-case K and then color the picture of the king flying a kite. This headband has pictures of a kite, koala, and a kangaroo to color in before wearing it. Learn to write lower-case k by tracing the dotted lines on this worksheet. Use a pencil to trace the gray lines while learning how to write lower-case ks. 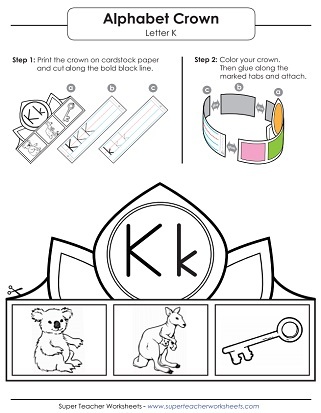 Have your students draw along the dotted lines to practice writing capital letter K and words that contain K.
Another handwriting worksheet for capital letter K; Trace the gray lines. Find the letters K and k, then write K and k five times, then write words that start with k.
Use an ink dabber to dot the circles on this worksheet in the shape of letter K.